Google Trekker takes to the British countryside. First stop Surrey. The first trail went live this month, March 2016. It covers the North Downs Way and is broken into sections. Here, for example, is Farnham to Guildford. Just click on an arrow to start moving. If you haven’t used Google Street View before, here’s a simple guide to get started. This project could, says The Guardian, hugely increase the number of people walking these trails. If “the Google effect”on Britain is anything like “the Wild effect” in the US, there will soon be unprecedented numbers of people walking the national trails that traverse some of the most beautiful countryside in England and Wales. ‘Wild‘ was the name of a book in 2012 and, two years later, a film about writer Cheryl Strayed’s life-affirming journey along the Pacific Crest Trail, the longest walking route in the world, stretching more than 2,600 miles from Mexico to Canada. Before ‘Wild’, only a few hundred hiking permits were issued for the trail every year. Last year it was more than 4,500 – and the number who walked the whole route quadrupled. Are you inspired to get involved? Google says that if you’re a tourism board, non-profit, university, research organization or other third party who can gain access and help collect imagery of hard to reach places, you can apply to borrow the Trekker and help map the world. Start here. 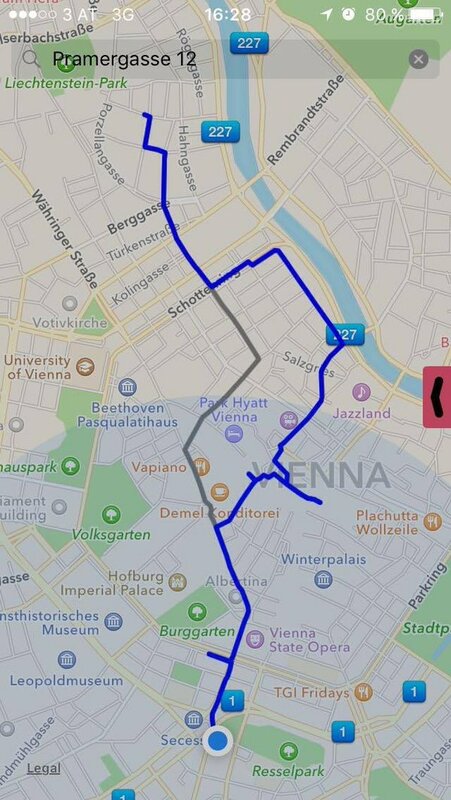 The Likeways app, say its creators, offers a novel approach towards wayfinding. If you want a direct route between A and B, try Googlemaps or Waze. But if you’re in the mood to meander and you’d rather be directed via a few interesting places, download Likeways (iOS only) and give it a spin. It’s less about geography and more about psychogeography. It was developed by Austrian Martin Traunmueller, a PhD candidate at University College London’s Intel Collaborative Research Institute for Sustainable Connected Cities. According to CityLab, Likeways reclaims urban walking from the realm of necessary drudgery and frames it as an enjoyable activity in and of itself. Traunmueller’s own wandering through London led him to what his now his favorite coffee shop; in much the same way, he discovered a secret garden in the backyard of an old factory building in London’s tech hub of Shoreditch. With his app, you can do the same. What makes a place interesting to Likeways is its social media presence. The number of Facebook likes it has indicates its popularity, which in turn prompts the app to include it in the route it generates. The more the route gets pulled towards it, the more likely it is that you’ll discover a snug coffee shop or a stylish boutique you never knew existed on an aimless Saturday afternoon drift around the town. This example map (right) shows two route options – in grey the shortest route and in blue the Likeway, leading through areas with high density of interesting venues. Feel free to meander at your own speed. Of course, drifting is not just about coffee shops. Interesting and unexpected features are much more important to the serious psychogeographer. The success of Likeways will lie in the kinds of Facebook pages it taps into, and they in turn are driven by what we choose to post and value. Let’s hope it grows into a maze of intriguing landmarks. Richard Louv’s book “Last Child in the Woods: Saving Our Children from Nature-deficit Disorder” was first published in 2005 but still receives a lot of attention from concerned parents and education professionals. Louv identified a syndrome he calls ‘nature-deficit disorder’ which implies that people, especially children, who have little access to the natural world can exhibit psychological damage. His work has been received with skepticism in some quarters, although it is often the driver behind activism related to digital detoxing and other ideas seen to be remedying the supposedly negative effects of technology. According to Wikipedia, Louv has said that “nature-deficit disorder is not meant to be a medical diagnosis but rather to serve as a description of the human costs of alienation from the natural world”. In the decade since the book first came out, we have become gripped by our online lives in a way Louv probably didn’t – couldn’t have – anticipated. Concerns about alienation have grown with the evolution of a very digital-savvy generation and certainly there are issues here to be discussed. But there’s a problem, I think, to do with the appeal this kind of claim has to a hungry press media always looking for the next big panic. “Last Child in the Woods” is an eloquent and moving read. I’d love to see an updated version that takes into account projects like the Digital Archaeology Weekend held in the New Forest in early 2016. Hundreds of children and their families joined experts for a weekend of gaming and archaeology including laser mapping, Minecraft, Oculus Rift and Google Cardboard. There’s a lot of that kind of thing going on, and I’ll be reporting on it here.